There are no good options left in Syria. The recent chemical attack in Douma and the response by the United States, United Kingdom, and France to that attack highlighted this point. The attack by the three Western powers raised many questions. In the United States, we are rightly debating the legality of the use of force in Syria without congressional approval. We are also debating the goals of such action, both what they are and what they should be. The fact is, just like its attack last year, the United States has no real goal in this latest adventure. The strikes did not remove Bashar Assad’s chemical weapons capabilities. Indeed, the sites had been evacuated in advance of the strikes, even though, according to the Donald Trump administration, there had been no coordination with Russia beforehand. No one knows what equipment or stockpiles might also have been moved, but the United States itself has admitted that Assad still has chemical capabilities. The U.S. action generated more controversy this time, yet it seems very similar to the strike last year. While Trump reveled in positive press coverage at that time, it soon became clear that the 2017 strikes—which were also ostensible responses to a chemical weapons attack—were little more than a show. The new strikes, though larger, seem like more of the same. Al-Marashi is correct. The US has no strategy, and it’s an open question what a productive strategy would be. One potential goal is ousting Bashar al-Assad. His crimes are horrifying beyond words. Other than cynical political interests in Moscow and Tehran, there is no conceivable rationale for wanting him to stay in power. But the simple fact is, Assad has won the war. The fighting may not have ended, and Syria is not going to be whole again for the foreseeable future, but Assad’s position is strong, he is backed by Russia, and his control of a large part of the country is established. It is possible still to dislodge Assad militarily, but only with a direct assault on his rule, requiring far more Western participation than we’ve seen before. That carries with it the risk of a major escalation with Iran and Russia, and it’s clearly a risk the United States and Europe are not willing to take, with good reason. Moreover, as noble a goal as it is to get so brazen a war criminal as Assad out of power, doing so by force would mean renewing the war in Syria and doubling down on the human toll it has already taken. That will be the case even if it does not lead to wider conflict between the West and Russia. Assad has certainly proven he will do whatever he deems necessary, no matter how horrifying, to maintain his rule. We must acknowledge that, short of a major escalation, there is no military path to ousting Assad. We know as well that diplomacy is a difficult road. There were real opportunities earlier in this conflict, first to support the Syrian masses who were rising up in 2011 and were being gunned down; and, later, after many outside groups had established their own roles in the burgeoning conflict, there was a chance to find a diplomatic solution if world powers were willing to prioritize the best interests of the Syrian people and find a compromise. But the Obama administration was uneasy about any resolution that left any part of the Assad regime in power. Russia was going to ensure that its one toehold in the Middle East, Syria, remained in their sphere of influence at all costs. Iran, Saudi Arabia, and various non-state actors all had their own agendas. Lost in that jumble of political, strategic, and ideological goals were the people of Syria. Given that stability is not likely to come to Syria in the near term, it is imperative that interested parties, especially in Europe and the United Nations, begin to lay the groundwork now for a long term, diplomatic resolution to the Syrian crisis. The goal should be stability that can end the violence and lead eventually to free and fair elections, as well as constitutional reform. Syria, despite the autocratic and despotic nature of the Assad regime, has, in its current constitution, structures that, with reform could form the basis of an open and even free society. That allows for an international effort to promote Syrian freedom, if it is rooted in Syrian democracy. This is far from ideal. That process will be measured in years, probably many of them. Both Russia and Iran will have to be involved and their interests considered, as uneasy as that might make the U.S. The United States and Europe will have to recognize that, as tempting as it might be to eliminate Iran’s “crescent” in the Levant, which connects it to Lebanon through Syria, and to eliminate the last firm Russian ally in the region, this will only continue to frustrate diplomatic efforts and make compromise impossible. Russia and Iran, for their part, are going to have to accommodate themselves to a future where, if they want good relations with Syria, they will have to cultivate them with a democratic and popular Syrian government, a much more difficult and costly process than cozying up to a dictator. A U.S. pullout, as Trump suggested recently, is just as untenable a prospect. Apparently, given Trump’s quick walkback on this point, someone (probably Defense Secretary Jim Mattis) explained this point to him. Assad may continue to hold the biggest chunk of Syrian territory, but he is unable to rebuild the devastated country he will rule. Even with full control of the country, the Syrian economy could not sustain such a project. Without the relatively resource-rich areas under opposition control, it is completely impossible. Russia, with its own economic problems, may be able to offer advice, military support and some shielding for Assad at the United Nations, but it simply does not have the capacity to rebuild the country. This fact is the key to moving forward. No matter how defiant Assad is, he will need international help to rebuild Syria. Eventually, that international effort must come with a price; it cannot be provided to Assad, but to the people of Syria, and that means it will be the reward for talks leading to a transitional, compromise government and free and fair elections that Assad must accept. Otherwise, he will rule a permanently crippled, permanently unstable country. A U.S. pullout from Syria must be the leverage used to press Assad in this direction—leverage Trump nearly threw away. But the prospect of an imminent US withdrawal presents other dangers. It is not hard to imagine what would happen if the United States leaves the area. 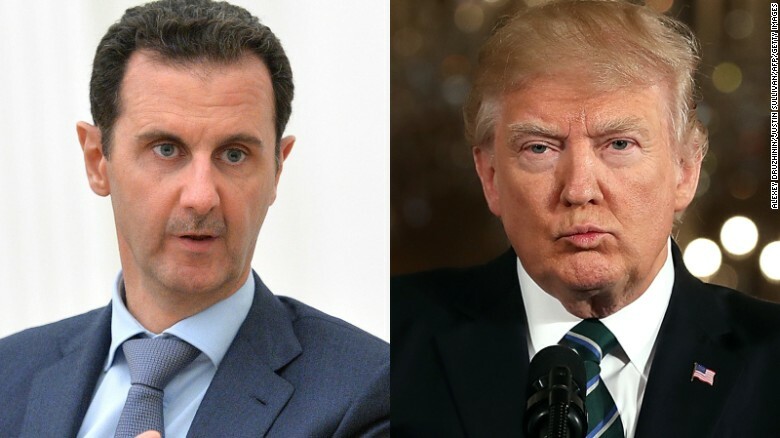 Assad, backed by Iran and Russia, will renew attempts to regain, probably incrementally, the territory anti-government forces aligned with the United States now hold. That means a renewal of the conflict. But there are graver risks. Turkey would be very likely to strike at the Kurds in Syria, something the U.S. presence currently deters, to a great, though not full, degree. The last thing Syria needs is incentive for other countries to further pursue their own military goals in the country. And if Turkish incursions are worrisome, how much more are increased Israeli strikes? Israel has been watching developments in Syria with increasing apprehension. That concern grew considerably when the Trump administration agreed with Russia to permit an Iranian presence, under Russian supervision, in the cease-fire zone in southern Syria last year. The growing Israeli apprehension is reflected in the steadily increasing incidents of Israeli strikes in Syria, strikes which already threaten to escalate into direct conflict with Iran. Had Barack Obama agreed to an Iranian presence in Syria so close to Israel, the so-called “pro-Israel” crowd would have said he is trying to destroy the Jewish state. Yet, while Israeli Prime Minister Benjamin Netanyahu continues to embrace Trump, this decision was not to his or any other Israeli leader’s liking. If the U.S. now pulls out of Syria completely, there can be no doubt that Israel will take much more robust steps to counter the Iranian presence. Unintended consequences could even lead to an all-out war between Israel and Syria, Hezbollah, and Iran. Withdrawal is not an option. The only productive way forward in Syria is through diplomacy, something the Trump administration is both loathe to pursue and ill-prepared to attempt, given the ongoing lack of diplomatic capacity in the State Department and the White House. Nevertheless, those who wish to see a post-war Syria that is rebuilt and leaving behind the despotism of the Assad regime must press for a realistic, long-term solution. That will mean a process like the various attempts at internationally brokered talks of the past. But for talks to succeed, or even make any progress, they must be approached differently. Russia must be pressed toward willingness to see a post-Assad Syria, but also reassured that their interests will be taken seriously and dealt with in negotiations. Without this, they will have no reason to press the Syrian government to talk. The goal of the Western countries needs to be a democratic Syria in the true sense, not one that is defined by its allegiance to the U.S. Iraq serves as a cautionary tale here, just as Libya does for an attempt to topple Assad by force. This approach is not going to be taken by the Trump administration, that is certain. But at least for now, Trump has made it clear that he does not intend to risk escalation, and it seems unlikely that this will change in the near term (with the ever-present caveat that we do not deal in certainty when our foreign policy depends on a combination of Trump’s moods and the daily commentary on Fox and Friends). This is a long term struggle, and if there is to be a useful forum where the will of the Syrian people can assert itself, the international community must begin to build the strategy and the incentives and disincentives to create it, starting now.